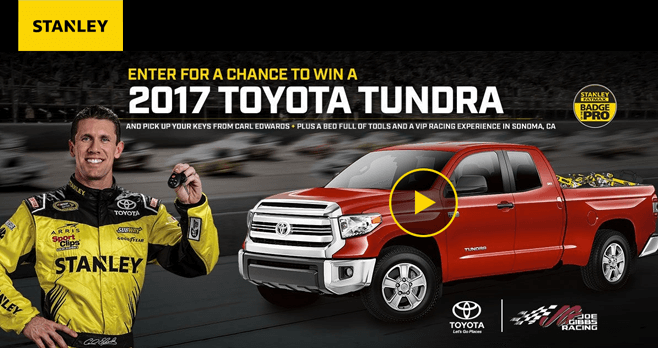 Enter Online At BuildYourTundra.com To Win A 2017 Toyota Tundra! Stanley FatMax is kicking off this year’s Build Your Tundra Sweepstakes and if you missed out last time, it’s now your chance to get in the action at BuildYourTundra.com. One lucky fan will win a brand new 2017 Toyota Tundra, plus a bed full with tools. Not only that, the winner and a guest will get to hang out with Carl Edwards and the Stanley Racing Team for a VIP Race Experience in Sonoma, CA. Visit BuildYourTundra.com between 11/1/2016-1/31/2017 to fill out the entry form for your chance to win. A 2017 Model Year Toyota Tundra SR5 Double Cab equipped with 5.7L V8 and Premium package including Entune Premium Audio with Navigation and App Suite and front bucket seats with power driver’s seat with power lumbar support, floor-mounted urethane shift lever and knob, tilt /telescopic urethane steering wheel, three front cup holders, front console box, auto-dimming review mirror with compass and HomeLink 15 universal transceiver, anti-theft system with alarm and engine immobilizer, 18-in. TRD off-road alloy wheels, Bilstein shock absorbers, rear-side privacy glass, engine skid plate, fuel tank skid plate, and decal, Spray-On Bedliner and All-Weather Floor Mats. A VIP racing experience comprised of a 4-day, 3-night trip for 2 persons to Sonoma, CA scheduled for June 23, 2017 through June 26, 2017. The Trip includes roundtrip coach air transportation, hotel accommodations for 2 people for 3 nights, STANLEY Racing VIP access on race day, meet and greet with a member of the Joe Gibbs Racing team and participation in a ceremonial awarding of key to the Prize Vehicle. An assortment of STANLEY tools and DEWALT tools and products. A check in the amount of $7,500 to help offset any tax-related expenses the Winner may incur in connection with the Grand Prize. During the Entry Period, go to www.buildyourtundra.com and complete the online entry form with all required information. Then, click to submit completed entry form to enter this Sweepstakes. The STANLEY FATMAX Build Your Tundra Sweepstakes 2016 is open only to legal residents of the Continental United States (excluding residents of Alaska and Hawaii who are not eligible to enter) or the District of Columbia, who are age 21 or older at the time of entry. Additionally, all participants must have auto insurance coverage and have a valid USA driver’s license. The entry period of this Sweepstakes begins on November 1, 2016 at 12:01 AM ET and runs through January 31, 2017 at 11:59 PM ET. Limited to one Entry per person during the entire Sweepstakes Period. The random drawing to select the Winner from among all eligible Entries received will be held on or about February 6, 2017. The total ARV of the Grand Prize is $52,993.23. Sponsored by Black & Decker U.S. Inc. Doing Business As Stanley Tools, 701 E. Joppa Rd Towson, MD 21286. For complete details, including Official Rules, visit www.buildyourtundra.com.